Strategic sourcing helps procurement officials to fulfill their dual roles pertaining to cost management and supply management. This is possible because strategic sourcing adopts a proactive approach to procurement rather than a reactionary or fulfillment approach. It also acts as a key driver for efficiency by formalizing the way spend data is collected, analyzed, and factored into the procurement processes. Driven by evidence and facts the benefits of strategic sourcing are enormous; thereby, making it a continuous process that considers factors far beyond just cost of a service or product offering. 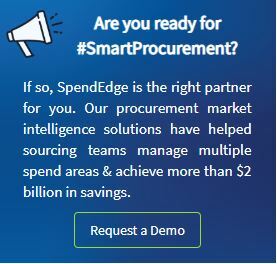 Moreover, it is one such approach that allows procurement professionals to consolidate their purchasing power to secure the best value available in the global market. The client- is one of the top players in the semiconductor industry in the United States. The organization is also one of the world’s largest independent pure-play semiconductor foundry. Also, several leading semiconductor industry players outsource their manufacturing processes to our client’ firm to reduce labor costs while investing capital in R&D. Continue reading to gain in-depth insights into the benefits of strategic sourcing or request a free proposal.